This article was written by Discover'sAndrew Moseman. Here's a neat dolphin trick that doesn't involve jumping through hoops. While dolphins sleep overnight (with half their brains and one eye at a time), they begin to show signs of the kind of insulin resistance that marks type 2 diabetes in humans. But when they wake up and have their breakfast, they switch back to their normal state. A research team led by Stephanie Venn-Watson announced the findings at the American Association for the Advancement of Science meeting in San Diego, and said that dolphins' apparent ability to switch insulin resistance on and off could lead to better understanding of the disease in humans. Insulin helps people control their levels of blood sugar, and the resistance to it inherent in type 2 diabetes means those levels can get way too high. The dolphins, though, switch on this temporary insulin resistance to their advantage, boosting blood sugar levels overnight. "Bottlenose dolphins have large brains that need sugar," Dr Venn-Watson explained. Since their diet is very low in sugar, "it works to their advantage to have a condition that keeps blood sugar in the body… to keep the brain well fed"
However, while dolphins can turn this resistance off once they start their day and revert to a normal state, they can have metabolic problems similar to diabetes, too. 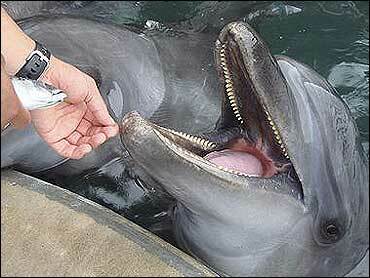 For 21 weeks, Venn-Watson and her colleagues measured insulin levels in six dolphins two hours after the animals ate. One dolphin that had especially high insulin levels compared to others, also had a 10-year history of iron overload, or hemochromatosis. Iron overload is associated with type 2 diabetes in people, Venn-Watson noted. No other animal has symptoms relating to diabetes so similar to humans, and the connection between the two species is probably our big, glucose-demanding brains. So, Venn-Watson says, studying them could help researchers figure out how to confront insulin resistance in humans: "There is no desire to make a dolphin a lab animal, but what we can do is compare their genes with human genes and look for evidence of a genetic switch"